Cooks of all skill levels can use a food grinder to prepare meat, breads and vegetables right from their own kitchen countertop. The KitchenAid food grinder attaches directly to a KitchenAid mixer, creating a versatile, multipurpose machine. Assemble the grinder by first inserting the spiral-shaped grind worm, end first, into the front opening of the largest part of the grinder, which is the body. Fit the cross-shaped knife over the exposed end of the grind worm followed by the grinding plate that has either small or large holes for fine or coarse grinding. If you are grinding raw or cooked meats, dried fruits, cheese or firm vegetables, use the coarse plate with the large holes. Attach the fine plate with the small holes when grinding raw meat, bread for crumbs or cooked meat for spreads. Tighten all the parts by screwing on the circular-shaped ring. Remove the silver cover from the hub, which is the piece that protrudes slightly on the front of the KitchenAid mixer, by turning the black knob next to it counterclockwise. Attach the food grinder to the mixer by inserting the attachment housing shaft into the opening of the hub. Rotate the attachment back and forth to ensure that the shaft fits securely inside the square socket located inside the hub. The pin on the attachment will fit into the notch on the hub rim when it is correctly positioned. Prepare the food you want to grind and cut it into small pieces. 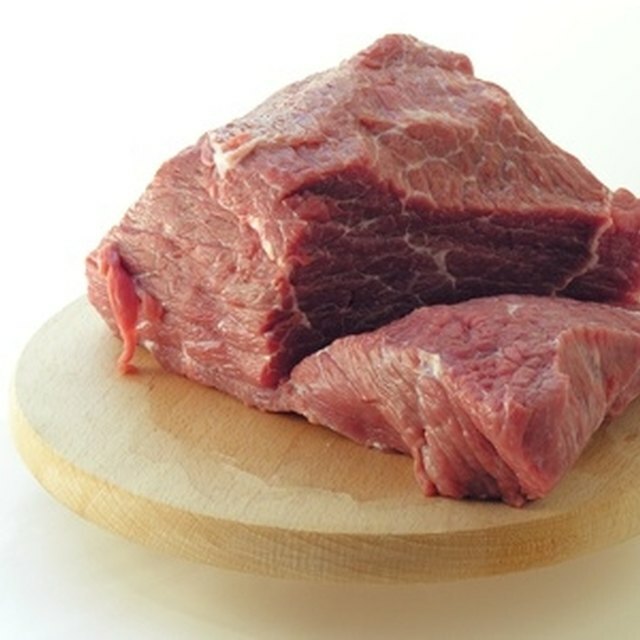 If you are grinding meat, cut it into long, narrow strips with a knife. Plug in the mixer and turn it to Speed 4. Place a bowl under the grinder to catch the ground food. Place the food into the tray that is the top part of the grinder. Use the wooden stomper to feed the food into the hopper, the opening in the tray that leads to the grinder. The stomper is the wooden, cylinder-shaped piece with a knob end; it is one of the parts that comes with the grinder. Turn off the food grinder after grinding the food; unplug the mixer. Remove the grinder body, grind worm, wrench and ring and wash them in the dishwasher or in warm, soapy water. Dry thoroughly. Hand wash the grinding plates, wooden stomper and knife in warm, soapy water only. Dry completely. Grind meat that is partially frozen for best results. Dry bread thoroughly before putting it into the food grinder. For best results, grind homemade bread fresh and toast it after grinding. Grind ground beef twice for more tender meat. Grind fatty meats one time only. Bread that is only partially dry may jam the food grinder. Use only completely oven-dried bread or bread that has not been dried at all. Karl Bruce has been a writer since 2009, writing a variety of articles for eHow. He holds a bachelor's degree in computer science from California State University, Chico, and has worked in the tech industry for most of his life.